Boil the pasta in hot water, with a huge pinch of salt and one teaspoon of oil as per the instructions on the box. Drain the cooked pasta. Place the broccoli and spinach in a deep pan, pour the stock over them, cover and cook till the broccoli is tender. Cool. Toast the pine nuts, set aside and cool. Peel the garlic. Place the broccoli, spinach, pine nuts, garlic, cheese, salt, sour cream, and pepper in a blender. Give it a spin. Pour the broccoli-spinach pasta on the cooked pasta. Mix well. Adjust seasoning. This very delicious salad can be served as a main course, but as we are all preparing for the upcoming festivals, and looking for something different to add to our Thanksgiving tables, I'd recommend this as a nutritious side dish too!! This simple and tasty salad goes out to No Croutons Required. It is being hosted this month by Holler at her blog Tinned Tomatoes. Holler is a vegetarian from Scotland - do visit her blog for some really super seasonal recipes!! This recipe for pasta salad also goes out to Presto Pasta Nights, a weekly food event started by Ruth. It is being hosted this week by Nilmandra of the Soy and Pepper blog. 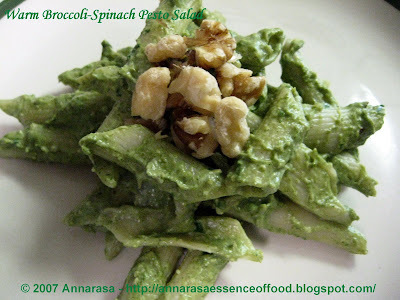 Wow, thanks for sharing another great pesto for Presto Pasta Nights. I'm always looking for a new one. While I don't always have broccoli in my fridge (it is there often), there is always a bag of baby spinach. I feel the same way about that as you do the broccoli. That looks like something I'd like! This looks amazingly good! Thank you for adding it to this month's No Crouton's Required. The line-up and voting poll will be up today on Tinned Tomatoes. WOw this is something new..lovely colour,yummy they r..
What lovely color! I love pesto and must give your recipe a try. Wow looks yummy and healthy. Nice entry to the event. Yummy...broccoli and pasta..sure shot combo!! You have so many wonderful recipes! I love your twist on pesto... so creative!